7275 IBPS Bank Clerk Recruitment 2018 Institute of Banking Personal Selection has personalized 7275 Bank Clerk Recruitment 2018. 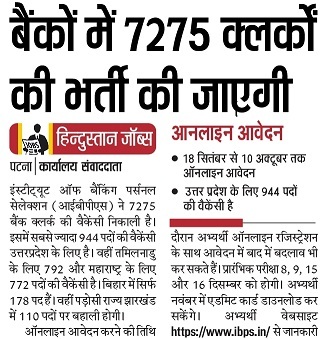 This Year Uttar Pradesh people will grab 944 vacancies, However Tamil Nadu 792, Maharashtra 772, 178 Bihar and 110 Jharkhand received good amount of Posts. IBPS Bank Clerk Age Limit to apply online candidate’s Minimum age should be 20 years and maximum age of applicant is 28 years. Age Relaxation for SC ST is 33 years, OBC 31, Handicapped 38 years. During Filling IBPS Bank Clerk 7275 Recruitment 2018 candidates can have option to rethink of correction in IBPS Bank Clerk 8 Recruitment 2018. IBPS Bank Clerk Pre Luminary exam conducted on 4 dates 8 December, 9 December, 15 December and 16 December 2018. Name of Post:- IBPS Clerk CWE VIII Online Form 2018. IBPS Bank Clerk Admit Card 2018:- Job Seeker from November will download admit card of 7275 Bank Clerk Exam. For More details you may check www.ibps.in. Age Limit:- Minimum age 20-28 as on 01/09/2018. 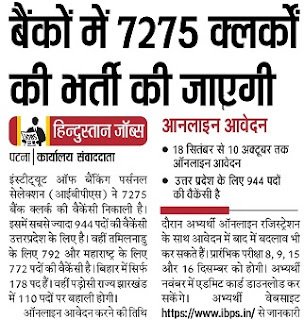 Total Number of Vacancies:- 7275.